at the Berlin International Film Festival. See all the photos at BERLINALE ! I’m afraid to say that is not so." 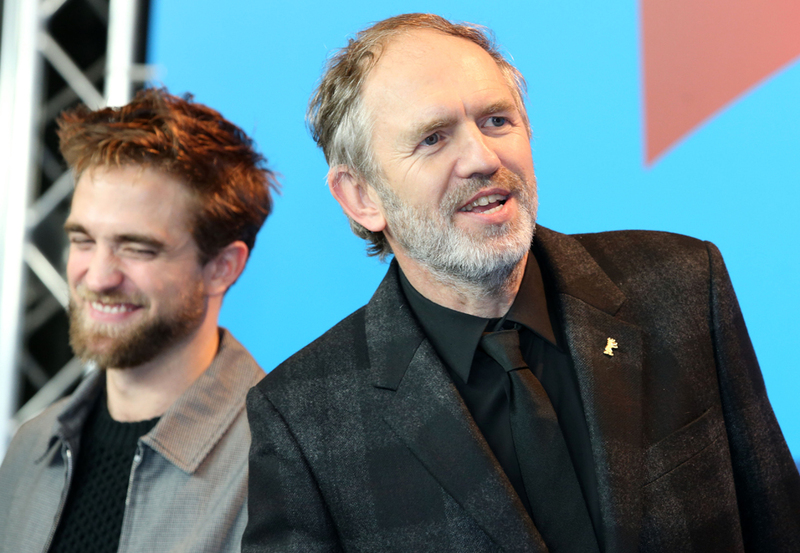 Although many related and pigeonhole the name of Robert Pattinson in the Twilight series, there are others, such as Dutch director Anton Corbijn who see beyond the stigma and / or social labels. So it is not unreasonable offer made British actor Dennis Stock’s role, that famous photographer 50s that caught James Dean three months before his death in the film Life. “After I felt Twilight Robert tried to choose characters away from this whole saga. “He wants to prove to the world that is a real actor can do challenging roles and that reminded me of Dennis Stock, a photographer in his early wanted to check I was good at what he did. That part was something I found in common between the two. On the other hand, Robert is always being chased by photographers and I liked the idea that the film had to act like a photographer behind a star", he said to questions expressed by Excelsior, Anton Corbijn. The filmmaker, who likewise attended the Festival last year to promote The most wanted man, was forceful in ensuring that while speaking of James Dean Life is not a movie about him, but the man behind the lens that made him some emblematic images that turned it around the world. “Whoever thinks that this film is about James, I’m afraid to say that is not so. “In fact, when I was offered the script I did not care because I did not want to make a film about James Dean, however, when I began to see that the story was more about the photographer, I felt identified because basically that’s what I’ve been doing since 40 years ago", said Corbijn. For Robert Pattinson after Twilight had shown that he wanted to remove the image of easy film actor, he was chosen to star in Life, directed by Anton Corbijn. On the tape plays professional photographer Dennis Stock, who came to have a friendly relationship with James Dean, legend of cinema. That closeness was born after the image Stock Dean took in 1955. Later, the filmmaker opened a a time for questions and answers …. About elect Pattison [sic] for the role of the photographer, he said he and Stock have some in common, at the time Stock sought the recognition, Same with Pattison [sic], who sought the chance to prove he’s a serious actor despite recent films that launched him to fame. He said he was not interested in making a film about the life of James Dean, the script liked by character of the photographer and that is why in Friday night hundreds of people had the opportunity to see the film to be released in theaters later this year. “The film, which was presented for the first time in February, within the framework of the Berlin International Film Festival, is an honest portrait of the friendship between the two characters which also highlights the performance of Pattinson, “I wanted to work with him because in his last films has shown that he is an actor capable of making a complex role beyond movies like Twilight and has tried to prove that he has more talent and I think that the photographer of the film is very similar, because you want to prove that it is capable of workingfor a major magazine”, Corbijn explained. Thanks to Robert Pattinson Australia ! Q: Mr. Pattinson, is James Dean still an icon to your generation? Q: You playing a photographer has a certain irony since in real life you often clashed with photographers who sometimes made your life hell. What was it like, playing a photographer? RP: They´re still doing it. But to be honest, I had a very preconceived notion of photographers. Just like Anton Corbijn. Our ideas couldn´t have been more different. For Anton, the whole movie is about the nature of the photographer. I didn´t see Dennis Stock as a photographer, but someone, who under all circumstances wanted to be an artist. He saw an artist in James Dean just like he saw himself as an artist. To me the movie is about those petty jealousies: why is Dean perceived an artist and not me. That´s what I liked about it. Q:Where do you get your self-confidence as an actor? RP: I stopped thinking about it and just do it. Often I worry afterwards but since it´s to late then, it doesn´t really matter. And I always remind myself that I actually really enjoy what I´m doing. Q: It´s been ten years since you started your career. Time for a resumee. How satisfied are you with your career? RP: In fact I´m exactly where I wanted to be. After Twilight I knew it would take a while to get to the next level but I´m gradually getting there. Of course I´m always trying to get better as an actor, but so much depends on the stuff you get offered. Acting is of course the outline, but every director offers you different possibilities. How honest, personal and affecting is LIFE.... Robert Pattinson is perfectly cast as Stock, a man adrift with an ex-wife from a teenage marriage and guilt filled about the young son he never sees. The main things you'll remember are Pattinson's best performance and the finest projectile vomit scene you’ve ever seen. Robert Pattinson in a sly turn as Dennis Stock...It’s the peculiarly moving, even subtly queer friendship between the two men that distinguishes “Life” from standard inside-Hollywood fare, while gorgeous production values and ace star turns make it a thoroughly marketable arthouse prospect...DeHaan and Pattinson enact this anti-romance beautifully, each man quizzically eyeing the other for leads and clues, while coyly retreating from scrutiny. Pattinson, adding to his post-“Twilight” gallery of sharp-cut screw-ups, brings intriguing layers of childish dysfunction to a character who is only ostensibly the straight man in the partnership. For Robert Pattinson, his take on iconic photographer Dennis Stock is equally as impressive as he enters the world of Hollywood from the other side of the carpet (and at bottom). Spotting Dean's talent early, Stock, in the two-hour running time attempts to get photographs of Dean before fame kicks in. Deadlines, pressure and awkwardness soon mount-up, and Pattinson expertly presents it onto screen. Robert Pattinson impresses in this stylish drama about the relationship between celebrity and the media. An intense mob formed around the Berlinale press screening of Anton Corbijn's Life — such is the continued allure of Robert Pattinson. 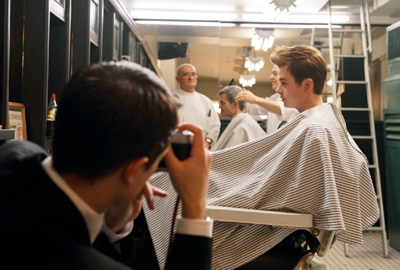 His fans beyond the festival will be pleased to hear that his brittle performance as LIFE magazine photographer, Dennis Stock, outshines Dane DeHaan's over-baked rendering of James Dean, although the latter is poignant enough to enliven this tale of men helping each other to take a leap into greatness...Pattinson's performance is as crisp as the white shirt and black suits his character always wears. This is a camouflage for his own problems that slowly unfurl, adding colour and improving the film...The social backdrop is just as carefully wrought. In another film, Ben Kingsley's fuming studio head, Jack Warner, would be The Other Man to Jimmy Dean and the tussle would be Saving Mr Banks flavour. Instead, Kingsley ball-busts just enough to give Jimmy's non-conformity gravitas, but the viewfinder is trained on the man behind the camera. Pattinson steps up, allowing more of his character's insides to come out. As Life proceeds the pace picks up and by the third act, it is a compelling dramatisation of an artistically fascinating alliance. The two leads convince as actors; it’s the characters that are more of a problem. DeHaan method acts his way into the persona of a consummate method actor whose cool persona was partly a protective screen; his Dean is very much in the mould of the Dean remembered by his East Of Eden co-star Lois Smith, who once said: “He was a sweet, rustic person, but there was also this suspicious, taut, guarded young man”. Pattinson’s hangdog character is defined by an exchange in which, after Dean tells him he’s disappointed in him, he replies “you’re not the only one”. While Pattinson has endured a lot of gratuitous bashing post-Twilight, he gives arguably the most fully rounded performance here. 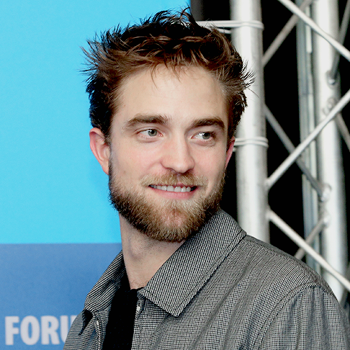 Thanks a lot to to Robsessed ! Synopsis: The story of ambitious Hollywood photographer Dennis Stock, who pitches a series of photographs for LIFE magazine featuring then rising star James Dean, resulting in some of the most iconic and endlessly reproduced images of all time. 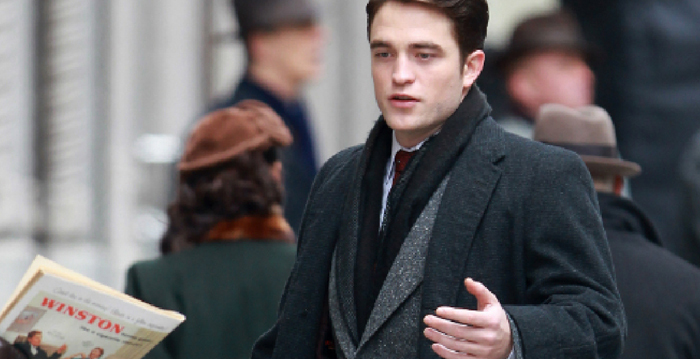 What You Need To Know: The second big Berlin title after “Queen of the Desert“ to feature Robert Pattinson, in a bigger role here as the photographer Stock alongside Dane DeHaan as Dean, Anton Corbijn’s fourth film is his most ambitious. The director has steadily and quietly become a favorite of ours with his meticulous, unshowy but elegant style of filmmaking, but this feels like a broader canvas than he’s worked with before —it’s a period piece (though admittedly so was his debut, “Control“) and one that will find him tackling one of the great icons of the 20th century, all set to a score by Owen Pallett who did such great work with Arcade Fire on Spike Jonze‘s “Her.” But it may also be very personal —Corbijn is responsible for some potent image-building in the famous photographs he used to take of rock bands, as anyone who’s seen “Anton Corbijn Inside Out” can attest, and surely has a very specific perspective on this story. Thanks to Robert Pattinson Worldwide ! 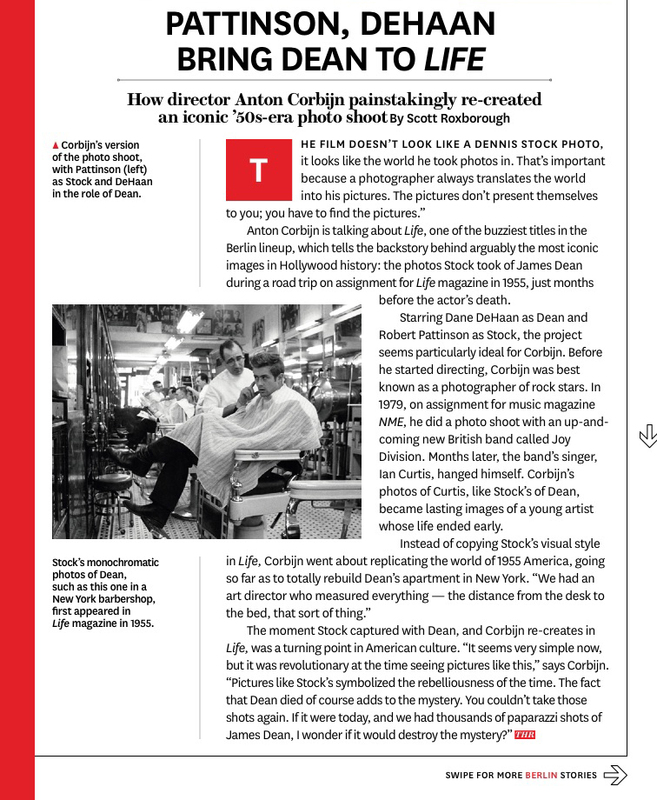 Anton Corbijn is talking about Life, one of the buzziest titles in the Berlin lineup, which tells the backstory behind arguably the most iconic images in Hollywood history: the photos Stock took of James Dean during a road trip on assignment for Life magazine in 1955, just months before the actor’s death. Starring Dane DeHaan as Dean and Robert Pattinson as Stock, the project seems particularly ideal for Corbijn. Before he started directing, Corbijn was best known as a photographer of rock stars. In 1979, on assignment for music magazine NME, he did a photo shoot with an up-and-coming new British band called Joy Division. Months later, the band’s singer, Ian Curtis, hanged himself. 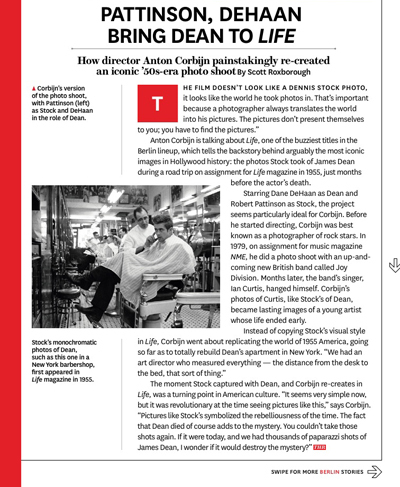 Corbijn’s photos of Curtis, like Stock’s of Dean, became lasting images of a young artist whose life was cut short. A release is planned for 2015.